Producers have very clearly defined goals and objectives when it comes to growth and production in commercial poultry operations. Fortunately, nutritionists also have a very clear knowledge and understanding of the nutrient requirements essential for growing birds and managing egg production economically and efficiently. The balance between efficient growth and production, as well as maximizing the economic potential usually leads to the question: “What’s in the Feed”? As nutritionists, it is our job to analyze and determine the best ingredients possible to be used in feeds in order to meet the nutritional requirements and optimize performance, while at the same time achieving the goals and expectations of the processing plants or grading stations. Since feed represents the biggest input cost in any poultry operation it is also important to maintain a balance between optimizing performance at a reasonable cost. As commodity prices change and alternative ingredients become more available, one may begin to think about reevaluating the ingredients going into feed. Poultry feed generally contains the following categories of main ingredients: grains, animal proteins, fat, macro minerals, vitamins/trace minerals and amino acids. The proportions of each of these ingredients in a feed will vary depending on the type of bird, stage of production and the performance goals being targeted. Energy is derived from organic matter and is required to fuel all life processes. This means that chickens cannot survive without adequate energy. Grains represent the biggest part of poultry feeds, with approximately 85% of the feed being made up of vegetable grain sources. While corn and wheat are the two most dominant grains used in Canadian poultry feeds, other grain based ingredients used in poultry feeds include: wheat shorts, wheat midds, canola products, flaxseed, corn distillers and barley. Carbohydrate sources are the main contributors to the overall energy in a feed with approximately 50% of the total energy in a feed coming from carbohydrates. Fat sources also supply energy to the bird and are used for specific metabolic functions in the body. Fat can be supplied from plant sources, such as canola and soybean oil, and animal sources, such as tallow. Additionally, fat can be provided in the feed as a blend of animal and vegetable fat. Fat also serves a functional role in that it is known to enhance palatability and feed quality. Proteins play a key role in poultry production and are an expensive component of poultry feeds. Proteins are composed of chains of amino acids, which are broken down in the digestive process and go on to contribute to many processes within the body. Protein is a major component of muscles, tissues and feathers, as well as being involved in various metabolic reactions. For this reason, poultry have a high protein requirement, whether for muscle production in broiler chickens and turkeys or egg production in laying hens. Some common protein ingredients used in Canadian poultry feeds include: soybean meal, full fat soybean meal, canola meal and animal proteins. Quality of protein sources is an important aspect for nutritionists to understand and consider. Because different protein sources have differing levels of availability to the chicken, nutritionists ensure that the proteins being used in the feed are of high enough quality and balanced in such a way that the chickens are being provided with the correct protein levels required to maximize performance. 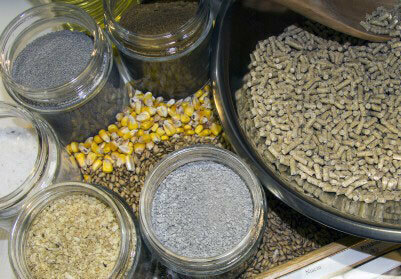 Another category of feed ingredients are macro minerals. This category of ingredients includes limestone which supplies calcium, dicalcium phosphorus which supplies phosphorus, and salt which supplies sodium and chloride. Macro minerals are involved in many different pathways within the chicken however; the skeleton is the key user of minerals within the body. As the skeleton is the base of a high producing bird, it is essential that these macro minerals are supplied at adequate levels to support the development, as well as subsequent strength, of the bones. Additionally, in laying hens, macro minerals are an important component of egg shells, so nutritionists ensure that these nutrients are being supplied at high enough levels to support egg shell formation. Micro premixes supply essential nutrients, including vitamins A, D, E, and the B-vitamins as well as the trace minerals copper, manganese and zinc. Vitamins and trace minerals are used for various metabolic processes in the chicken. They are required in very small amounts, but any deficiency in these nutrients can lead to a dramatic loss in performance. Synthetic amino acids are important feed ingredients because they allow nutritionists to precisely balance for any deficiencies. These deficiencies occur because the amino acids being contributed by the organic protein sources in the feed will not match exactly what the bird requires to maximize growth and production. While supplying multiple protein sources with different amino acids profiles will increase the likelihood of reaching the required levels of each amino acid, there is typically still a need for specific synthetic amino acids. Synthetic amino acids that are available for use in poultry feed include lysine, methionine, threonine and tryptophan. Using these synthetic amino acids in feed formulation allows nutritionists to ensure that the amino acids required are present at the correct level in the feed. Chickens grown on commercial poultry farms rely entirely on the feed provided to them to supply all of the nutrients they need to grow and thrive. As a result, it is the role of a nutritionist to ensure that the specific ingredients and nutrients being provided in the feed will optimize the performance of the bird, while still being profitable for the producer. Since feed represents the greatest cost associated with raising poultry there continues to be a need to evaluate new ingredients and continually monitor the quality of the more common grains like corn, wheat and soybean meal. The feed provided to the birds will be completely balanced for energy, protein, amino acids, macro nutrients, vitamins and trace minerals, as nutritionists understand that a shortage of any these nutrients could lead to lost performance and profits for the producer. Feed is only as good as the ingredients that go into it, which is why we ask ourselves “What’s in the Feed”? Nutritionists will always strive for quality, consistency, efficacy and economics while maintaining profitability for producers when formulating feeds used in today’s market.